What is the purpose of the M.C.A.N.A. Monthly Business Meeting! As your group’s new GSR/Co-GSR it’s natural to feel a little nervous since doing new things and taking on new responsibilities is a scary proposition for anyone. It’s impossible to know what to do until you’ve done it? That’s the purpose of this welcome letter, and the new GSR’s pack you’ve just received. It’s to help ease the anxiety a little by giving you an idea of what is expected of you and what is going to happen at this Area Meeting. In it you should find a copy of the current Area Guidelines. This is the “rulebook” by which the M.C.A.N.A. conducts its business. It is suggested that you give the entire Guidelines a thorough reading after the meeting, and go back over the confusing parts. You can always ask questions about the guidelines at any area meeting, or ask members of the administrative committee, they will be happy to help as they can. You should also find a copy of the Area Motion form. This form must be filled out in order to have any new business brought up at the area meeting. It is suggested that you make copies of this form, so that they are handy when the need arises. Extra forms will always be available at the area meeting. You should find a quick reference called “How an Area Meeting is Conducted“. You might want to keep this out and handy so you can follow along as the area meeting progresses. Finally you should have another paper called “What Else Can I Do?”, which is a list of practical suggestions on how to be an effective GSR both for your home group and for the fellowship as a whole. There should also be a small pack of paper and a pencil to help you take notes with. Don’t worry about trying to write everything down. The area secretary will be sending you a copy of the meeting’s minutes. The minutes will contain all the vital information about motions, votes and reports. Still, there are always times when it’s a good idea to write down your impressions to take back to your group when it holds it’s next business meeting. There are five things you need to do whenever you come to the area meeting. The first is to find your way to the flyer table. Help yourself; they are free for the taking. Some flyers might be in short supply, so please only take one or two so everyone might get one. You can always make copies. Also take a look for any large manila envelopes, and check them for your group’s name. This is mail from the World Service Organization (WSO) and contains pertinent information for your group. The second thing to do is make sure you sign the sign-in sheet. This helps us keep track of which groups are active at the area level so we can offer help or guidance to those groups that might not be able to send a representative. You can find the sign-in sheet on the same table as the flyers. The third thing is to fill out a mailing label. These are usually right next to the sign-in sheets. It is extremely important that you do this. There is no way we can mail you minutes of the area meeting to use at your group’s business meeting. No label, no minutes! A one or two sentence summation of how your group is doing as far as attendance, willingness and finances are concerned. List any open service positions at your group. Hold onto your report, you will need it for the roll call at the beginning of the meeting. Even if you come in late, make sure that you give the area secretary your group report so it can be included in the area minutes. There is a lot to take in, no one expects you to know it all. It will be a huge benefit to get with one of the experienced GSR’s and sit with them. They will be happy to help you out. Once again, WELCOME! When/Where is the M.C.A.N.A. Monthly Business Meeting held? On the second Sunday of each month the area meeting is held at the Eastside Alano club, the meeting start time is 10:30a.m., 11487 E 9 Mile Rd, Warren, MI 48089. Every month the area meeting is conducted in a very similar manner and this follows a monthly agenda. We’ll quickly run over a typical agenda, so you will have an understanding of what is happening, when and why. Each month begins with the Serenity Prayer, and several readings just like a regular NA meeting. At your first meeting pay particular attention to these readings. They are very important. After the readings a call will be made by the area chair for new GSRs and Co-GSRs to introduce themselves. Don’t be shy! It is very important that you introduce yourself so experienced GSRs and other concerned members can seek you out and offer you help and guidance. Always remember you are in a room full of people that are eager to help you, but you need to be willing to accept that help. After the GSR introduction the treasurer will start the roll call of area groups. Each GSR gives a report on their group and announces the group’s donation to the area. Immediately after the announcement the GSR will go to the front table giving a copy of their group report to the secretary, and their area donation to the treasurer. The treasurer should give them a receipt to take back to the group treasurer before they sit back down. When the roll call is complete there is a short break and the 7th Tradition basket is put out, just like at any other NA meeting. Also, like at any other meeting, if you got it give it, otherwise keep coming back until you do. Once all the hub-bub dies down the area chair will have a review of any vacant positions that need to be filled at the area level. If you know of anyone willing or would like to nominate someone for a position this is when to do it. GSRs are asked to return to their groups and announce any vacancies during the groups call for NA announcements after their secretary’s report. After this, will come a series of reports by various members of the administrative committee. There is a general format here, not written down but followed to keep a semblance of order. First the committee member will read their report. After the report has been read, there will be a few minutes taken out for general questions on the report by any concerned attendee of the meeting. When the questions have been answered the report is turned into the Secretary to be included in the minutes. Reports are given monthly by these members of the M.C.A.N.A. : Chair, Secretary, Treasurer, Regional Committee Member (RCM), the Activities, H&I, Public Information, Helpline, Newsletter, Outreach and Literature Subcommittee Chairs, if such exist. Once all the reports are accepted, old business is taken up. Old business includes any issue from a previous area meeting that has not been concluded, usually by taking a vote. Any voting on subjects that were referred back to the groups the previous month takes place during this session of the meeting. Please be aware that, barring any special motions passed from the floor, no discussion will take place on motions in this part of the meeting, only voting on the issues at hand. If you have any questions feel free to ask an experienced GSR or one of the members of the administrative committee. After all old business is attended to the floor is open for discussion of new business. New business consists of any motions presented to the chair or secretary during the Administrative Subcommittee meeting prior to the general meeting, or during the course of the general meeting. The people allowed to bring motions before the area are listed in the area guidelines. All motions for new business must have a person to second them, be in writing and have a clearly expressed intent behind them. Once a motion is brought before the meeting, the chair will read the motion, and call for any discussion. Three opinions for the motion (pros) and three against (cons) will usually be the most discussion allowed by the chair. It is important that you not interrupt those who hold the floor during discussion of new business! Please raise your hand if you would like to add something to the discussion, and the chair will call on you in time. Some motions will be voted on immediately, and others you will take back to your group for discussion and voting by your group’s members. The chair will announce which motions go back to groups. They will appear in the monthly minutes also. Once all new business is discussed, the chair will allow any open discussion to come from the floor. Here is where anyone at the meeting can speak their peace on any subject they feel concerns them and the M.C.A.N.A. Everyone will get a chance to speak, time permitting. When everyone has completed, chair will ask for a motion to close. This is seconded and voted on immediately. We close the area meeting like any other NA meeting, by forming a circle, closing with a prayer, and hugs for everyone. It’s an awful lot to take in all at one time. Just like a newcomer to the fellowship can’t take all of the program in at one time, or do all the steps in one day, so the GSR can’t learn the whole job in one area meeting, or just by attending area meetings. Being an effective GSR for your home group home group involves more than attending its business meetings and taking an area donation in once a month. What follows is a list of suggestions of things a GSR can do to make his life easy, become a more effective GSR, and to help the Fellowship as a whole. Always have paper and pencil (or pen) ready whenever you attend any business meeting, whether it is at the area or your home group. Lots of times good ideas fly thick and fast, and you want to try and catch them while they are still fresh in everyone’s mind. Get a large 3-Ring binder for you home group to keep all the group’s paperwork. If the group can afford it, they can reimburse you. If not donate it if you can afford to. You will be amazed at how much time, effort, and stress is saved by having all the notes, minutes, motions, forms, etc. all in one location rather than scattered about. Write your GSR report before the area meeting, perhaps immediately following your group’s business meeting. The time before an area meeting is pretty hectic and chaotic with many people fellowshipping, signing in, getting motions and reports in order. It’s almost impossible not to be distracted. Seems like something is always forgotten when the report is left to the last minute. Getting organized is just a start, a GSR also needs to be educated. There are a lot of things a GSR needs to know to do the job effectively. It involves a lot of reading, from many different sources. One of the simplest places to learn about being a GSR is the I.P. “The Group” on just about every NA group’s literature table. On page 7 there is a short description of the duties of a GSR and Co-GSR. Another place to look is in the Guide to Local Service. There are explanations of the responsibilities for Service Positions at every level of the NA service structure, and it is highly recommended that you read and understand at least the sections concerning service at the group and area levels. This service guide is be available at the MSO. For those interested in the nuts and bolts of how meetings work a good source of info is the Robert’s Rules of Order. You should be able to get a copy at any good book store. They explain things like motions and chairpersons and who gets to speak and when. An excerpt from will follow shortly. Theses are practical guides to NA service. You also need to be aware of the principles these guides are predicated upon. The first principles are the Twelve Traditions. A great place to find out about these is your Basic Text and the How & Why study guide. Another set of principles that NA service is based on is the Twelve Concepts. Many have never heard of these until they attend an area meeting for the first time. A booklet called “The Twelve Concepts” is available for sale at the MSO, it is suggested that you buy a copy, or if you can’t afford one, ask around at the area meeting, someone should be willing to lend you a copy. While being organized and educated are important, the greatest service a GSR can do for his home group and the Fellowship is to get involved. By now you are aware that there are more things to get done than there are willing bodies to do them. No one will expect you to try and do it all yourself. 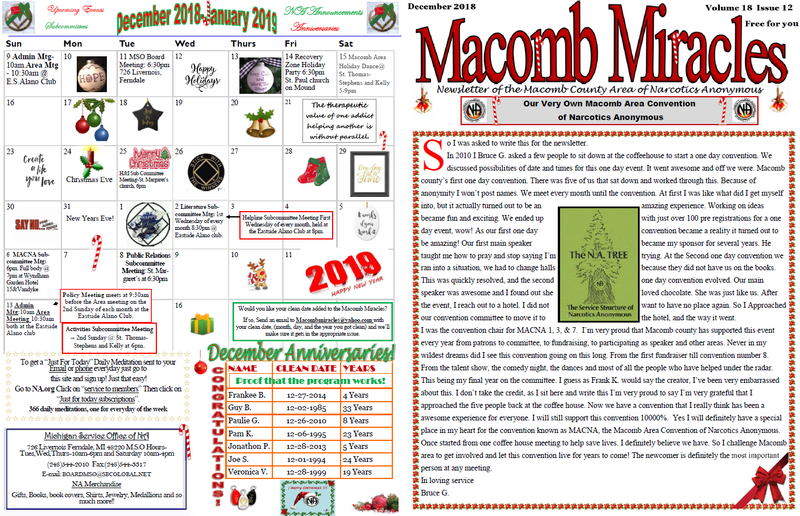 There are simple things that you can do that will go a long way toward promoting unity between all the groups in Macomb County and within the Fellowship as a whole. The most important thing you can do as a GSR is to make announcements, not just at you home group, but any meeting you might attend. The I.P. “The Group” says about GSRs “The most important facet of this position is to be communicator for the group”. The best way to do this is to stand up and make announcements after the secretary’s report at every meeting you attend. Sure, some members may make smart cracks, and others will whine about the announcements taking so much time, but the vast majority of NA members will appreciate every bit of information they can get about our fellowship. The second way to get involved is to try and help the groups you regularly attend that may not be able to send a GSR to the area. Pass them a copy of the area minutes. Help them set up a business meeting. Announce their open service positions at other meetings. You might be surprised seeing a meeting blossom into an active member of the NA community. A lot of meetings don’t know the rudiments of NA service, other than to have coffee ready and a person to chair. It’s the old story – if you give a man a fish he eats for a day; if you teach him to fish, he eats for the rest of his life. Do what you can to teach these groups how to have a business meeting, tell them what a GSR does, and someday they may be sending their own GSR to the area. Last but not least, it is hoped that an active GSR be involved with subcommittee work. This does not necessarily mean you have to be the chair or other position on the subcommittee, but find one that seems interesting to you and go to their meetings to show your support. If time and willingness permits you may find yourself with a position on a subcommittee, but it is most important to show support. Subcommittee work will help you to see on a smaller scale how the Area, the Region and the World Service Committees work. It will teach you valuable teamwork and leadership skills that you can take with you into every area of your life, not just in NA service. Meetings will be conducted according to these rules of order, adapted from Robert’s Rules of Order. This time-honored system for conducting business is the clearest way yet devised for getting a maximum amount of business done in a minimum of time, regardless of the degree of disagreement among the participants. These rules are meant to be used as tools to help us make orderly collective decisions in a cooperative, respectful way in the spirit of our Twelve Concepts; please do not use them as weapons against one another. We encourage all participants to become familiar with these rules of order and conduct themselves accordingly. Once the meeting is under way, only one matter will be before the committee at any one time and no other discussion is in order. Please respect the chairperson’s right to be in control of the process of this meeting so that you can have maximum benefit of its content. Debate is the formal exchange of views on an idea. Unless otherwise specified, debate on both main motions and parliamentary motions is usually limited to two or three pros and two or three cons (speakers for and against the motion). Speakers addressing a motion in debate usually have two or three minutes in which to speak their minds. There are two basic types of motions. It is important to understand the difference between them. The two kinds of motions are main motions and parliamentary motions. A motion is a statement of an idea a committee member wants the committee to put into practice. After being recognized by the chairperson, the member says, “I move that such-and-such be done by (this committee, one of its subcommittees, or a particular individual) under these terms.” The person making the motion then speaks briefly about why he or she feels the idea is important; this is called speaking to the intent of a motion. Because the exact wording of all motions must be recorded in the minutes, the maker of the motion should write it out whenever possible. This is especially important for long or complicated motions. Every motion requires a second–the backing of another person who either wants the idea put into practice or simply wants to see further discussion of the idea take place. After one person makes a motion, the chairperson will ask whether the motion has a second. The person who seconds the motion simply raises a hand and, when recognized by the chair, says, “I second that.” If nobody seconds a motion, the chair will say, “The motion dies for lack of a second.” This means that the idea will not be discussed any further because there is not enough interest in it. The committee then moves on to other business. Once a motion has been made, the chairperson may rule it out of order. A motion may be ruled out of order for any one of a number of reasons: the motion goes against the committee’s standing policy, clearly contradicts one of the Twelve Traditions or Twelve Concepts for NA Service, or is inappropriate at the particular point in the meeting at which it is made. Robert’s Rules of Order can be consulted for more specific examples of motions, which are out of order at any given time. Any member of the committee who wishes to challenge a ruling made by the chairperson may appeal that ruling, as described below. If no appeal is made, or if the decision of the chair is upheld, the committee moves on to other business. Parliamentary motions can be best understood as “sub-motions” made during debate on a main motion that affect that motion in some way. There are many more of these than space and practicality permit us to include here, but a few that seem to be the most practical are discussed below. This is perhaps the most commonly used parliamentary motion. During debate on a motion, if a member feels that the motion would benefit from a change in its language, that member can say, “I move to amend the motion…” and suggest specific language changes in the motion. Ordinarily, an amendment must be moved and seconded before it can be debated. When debate on the amendment is exhausted, the body votes on the amendment. Then, debate resumes on the merits of the main motion (as amended, if the amendment has carried). When debate is exhausted on the merits of the main motion, a vote is taken and the body moves on to the next item of business. If an amendment is offered and the persons making and seconding the original motion accept it, no second is required, no debate is called for, and no vote need be taken on the amendment; debate proceeds as if the main motion had been formally amended. This is called making a friendly amendment. Motion to call the PREVIOUS QUESTION. For our purposes, this may be the most important parliamentary motion. Use it often. This motion is made by a member saying, “I call for the question,” or ” move the previous question. ” It is another way of saying, “I move that debate stop right now and that we vote immediately.” This is one of many motions that can be used to prevent needless, lengthy debate once an issue is clearly understood. This motion is in order after any speaker is finished. You need not be called on. The chair must recognize you when you make this motion, and a vote must be taken with no debate. If two-thirds of the body feels that no more debate is necessary, then it is time to vote and move on. One point worth making about this motion is that you must be careful not to squelch debate before an issue has been thoroughly aired. Be sure to vote “no” to this motion if you are still confused about the issue at hand or are unsure of how to vote. By allowing debate to continue, we avoid half-baked decisions about half-understood questions. On the other hand, the liberal use of this motion makes it unnecessary for the chair to be heavy-handed in stopping discussion, because the chair knows you will stop it soon enough. One way of disposing of a motion that is not ready for a vote is to table it. This is done by saying, “I move we table this motion until such-and-such a date/meeting. ” This motion is not debatable; if it is made and seconded, it is voted on immediately. If it fails, debate continues on the motion itself. If it passes, the committee moves on to its next item of business. The tabled motion will be included in the committee agenda on the date specified. Motion to REMOVE FROM THE TABLE. A motion that has been tabled can be taken up before the time originally set in the motion to table. This is done by saying, “I move to remove from the table the motion to such-and-such.” If this motion passes, the motion that had been tabled becomes the main motion and debate on it begins again. If the motion to remove from the table fails, the body moves on to the next item of business. Sometimes the committee does not have enough information to make an immediate decision on a main motion. Such motions can be removed from debate and sent to either a standing subcommittee or an ad hoc committee for further study. This can be done by a member saying, “I move to refer the motion to the such-and-such subcommittee.” If the motion to refer is seconded, the body may debate it before voting. If the motion to refer passes, the committee moves on to its next item of business. If the motion to refer does not pass, the committee either continues debating the main motion or votes on it. The subcommittee to which a motion is referred will take it up at its next meeting. The subcommittee will report back on what it has come up with at the next meeting of the full committee. Motions to RECONSIDER or RESCIND. Sometimes a member feels that a motion the committee has passed will prove harmful. That member can move to either reconsider (reopen for debate and voting) or rescind (void the effect of) the original motion. The motion must have been passed in either the last month’s or the current meeting. The member making the motion must have information on the issue that was not available in the original debate on the motion. The member must have been with the winning side in the original vote. These limits are placed to protect the committee from having to reconsider again and again the motions it passes while still allowing it to examine potentially harmful situations it has created inadvertently. If any of these requirements are not met, the chairperson will declare the motion out of order. The motion to reconsider requires a simple majority provided that committee members were informed prior to the meeting that such a motion would be made. If prior notice is not given, the motion to rescind requires a two-thirds majority. Request to WITHDRAW A MOTION. Once a motion is made and the debate begins, the maker of the motion may ask to withdraw it. The chair asks if there are any objections. If there is even one objection, the motion stays on the floor and debate resumes. If there are no objections, the motion is withdrawn and the body moves on. A substitute motion is the same thing as an amendment to a main motion. The only difference is that it is offered to entirely replace the original idea, instead of merely revising a portion of it. It is handled in the same way an amendment is handled. Any voting member may move to adjourn at any time. This motion is always in order, is not debatable, and requires a simple majority to pass. Obviously frivolous motions to adjourn may be ruled out of order. After all business is finished, the chair may declare the meeting adjourned without a motion. In addition to parliamentary motions, there are other ways in which members may alter or clarify the proceedings. Here are a few of the most common. If a committee member feels that business is going too far astray from the original agenda, that member can help get things back on track. The member says, “Call for the order of the day.” This means, “I move that the chair bring us back on track and conduct the meeting according to procedure, adhering to the agenda.” This does not require a second, is not debatable, and does not even require a vote–the chairperson is obligated to enforce the request unless two-thirds of the body tell the chair otherwise. If a committee member needs certain information before making a decision about a motion at hand, that member can say at any time to the chairperson, “Point of information.” This means, “I have a question to ask,” not “I have information to offer.” One does not need a second to raise a point of information; it is neither debatable nor to be voted upon. The person raising the point of information may ask the question of either the chairperson or another member of the body. If it appears to a committee member that something is happening in violation of the rules of order, and if the chairperson has not yet done anything about it, the member can ask the chairperson for clarification of the rules at any time. The member may simply say out loud, “Point of order.” The chairperson then says, “What is your point of order?” The member then states the question and asks the chairperson for clarification. If the chair agrees that the rules are not being followed, the chair says, “Your point is well taken” and restates the appropriate rule. If the chair does not agree, the chair says, “Overruled.” This decision, as all others, can be appealed. Any time the chair makes a decision, that decision may be appealed. Any voting member who wishes to appeal a decision may do so by saying, “I appeal the decision of the chair.” If the appeal is seconded, the chair then asks, “On what grounds do you appeal my decision?” The member states the reasons. The chairperson then speaks briefly to the intent of the ruling being appealed. The body may then debate the ruling and the merits of the appeal. A vote is taken, requiring a simple majority to overrule the original decision of the chair. If a committee member wants to do something but doesn’t know how it fits in with the rules of order, all that member has to do is ask. At any time, a member may simply say out loud, “Point of parliamentary Inquiry.” The chairperson must immediately recognize the member so that person may ask how to do such-and-such. The chair will answer the question, possibly by referring to a specific passage in this document in explanation. A point of parliamentary inquiry needs no second, is not debatable, and is not voted upon. If the smoke is getting too heavy for you, the air conditioner or heater is on too high, or if there is too much noise in the room, you can ask that something be done about it. If the matter is urgent, you may interrupt the proceedings by saying, “Point of personal privilege;” if the matter is not particularly urgent, you are encouraged to wait until the person speaking has finished. Such a request generally requires no second, and the chair must recognize you immediately. State the situation and ask that it be corrected. If your request seems reasonable, the chair will accommodate you. There are several ways that votes can be taken. The most commonly used method is the show of hands. With rare exceptions, votes will be taken by a request from the chair to see the hands of all in favor, and then all opposed, then all abstaining on each issue. The chair should ask for all three categories every time, just to be thorough, even when the majority is overwhelming. These are only brief notes on rules of order for business meetings. For further information, see Robert’s Rules of Order–Newly Revised.